Retired music teacher Arthur Leggott is battered to death with a torch in his cottage in Badger's Drift after sneaking out of the Cedar's care home to search for a missing document. Arthur taught the late composer Joan Alder, famous for Midsomer Rhapsody, and Barnaby and Scott wonder if Arthur owned a valuable musical score. Arthur left all his possessions to the Joan Alder Society run by Owen Swinscoe and Alan Thorpe, husband of Joan's sister Melody. The society has restored Joan's family home as a living museum, but Swinscoe claims Joan's husband Michael Maybury hates the museum because it might stir up interest in the car crash which killed her. Scott carries out a painstaking search of Arthur's effects but finds nothing. After the auction, however, dealer Harvey Crane unearths an early version of Midsomer Rhapsody among his purchase of box files. He offers to sell it to Joan's agent and former lover Laura Crawford for £50,000 before reaching a deal with Swinscoe for £120,000, subject to authentication. An excited Swinscoe believes handwriting on the manuscript shows Joan was working on the score while still a schoolgirl taking lessons with Arthur, shortly before meeting and running away with her first love, John Farrow. At the opening of Joan Alder House, Laura stuns the crowd by introducing a young woman, Sarah, as Joan's long-lost daughter. Reeling in shock outside, local vagrant Hedge is hit by drunker builder Joe Smeeton's car. Barnaby realises Hedge is John Farrow, thought to be dead, and Sarah is his daughter. Bullard finds evidence of another composer's hand in writing the Rhapsody, while John sells Swinscoe a love letter from Joan in order to get cash to buy Sarah dinner. As Swinscoe examines the letter, he spots something that makes him realise the musical score is a fake. Then, after a drunken and argumentative evening in the pub, he is pushed from a bridge. As another villager meets a gruesome end and Joan's mother Peggy prepares for her wedding to fellow pensioner Charlie Speight, Barnaby and Scott must probe bitter family feuds and long lost love affairs. Can they discover what is real and what is fake and who is the killer trying to rewrite the past? 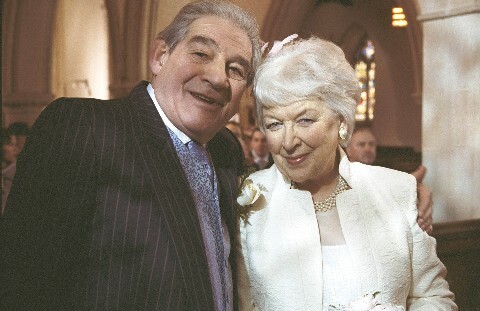 Getting married in 'Midsomer Rhapsody' proved to be an enjoyable - if chilly - experience for JUNE WHITFIELD. "Peggy Alder is in a retirement home and she meets a chap called Charlie through her love of music. Her daughter Joan was a great musician before she died so that is what Peggy loves in him. "They are a very good partnership - he is an eccentric character but she is just as bad. They probably have midnight games of scrabble, but they genuinely care for each other. "We get married in a very cold old church out in the country. It was February and absolutely freezing especially when we had to take off jackets and coats. But I did manage to smuggle in a pashmina and I had legwarmers underneath my outfit! The role required June to sing. "I have sung in my youth and I can vaguely keep in tune for a short time. I have to sing 'We'll Meet Again' and Trevor Peacock as Charlie is accompanying me on the piano. We are all rather sad as someone has just died. June is a Midsomer Murders fan and has seen all the films. She said it was great working with John Nettles and meeting them all and she rather enjoyed being grilled by Barnaby! TREVOR PEACOCK had fun becoming an accomplished musician for his role. "Charlie is a jack of all trades in the entertainment business who has now retired and found romance. He is in great demand for playing the piano. I have a scene with David Burke, who plays Hedge, where we play the Midsomer Rhapsody together, with him on the violin as I play the piano. "As neither of us can play a note, it was recorded by two brilliant musicians, while I mimed it with a piano that didn't make any noise, accompanied by David playing scratchy noises on the violin, sounding like a cat being strangled. "At the end I look up to him and have to say "you are not a novice on that". He replies to me "you are not so bad yourself". It was so funny and the continuity lady had to go and sit down for 10 minutes because she was laughing so much." One of Trevor's most famed roles is playing Jim Trott in The Vicar of Dibley.